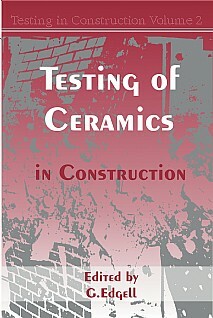 A comprehensive guide on the testing of the main ceramic elements used in the construction industry. Standard tests on fundamental products such as bricks, tiles and pipes are described and how these translate into practical procedures. The majority of authors have been involved in the drafting of Europe-wide standards, resulting in authoritative statements about the choice of test procedures, the state of the art, level of compromise and areas where no compromise is possible. This is a thorough treatment of European practice which finds acceptance worldwide. Chapters covering larger elements such as walls, full scale tests, as well as model and accelerated testing, are included. Tests concentrate mainly on new products or structures and techniques for dealing with the performance and condition of existing structures are included. Codes and Standards by which brick masonry is designed are described. The future role of test method development using IT is discussed with its associated potential benefits. Introduction; Materials testing; Standard tests on masonry units; Standard tests on clay pavers; Standard tests on wall, floor and roof tiles; Standard tests on vitrified clay pipes; Standard tests on flue liners; Standard tests on hollow clay pot flooring; Other tests; Element testing; Compressive strength; Flexural strength; Shear strength; Bond strength; Prototype testing; Full scale testing; Wall testing; Reinforced and prestressed masonry testing; Arch bridges; Explosion; Fire testing; Impact; Model testing; Accelerated testing; Rain penetration; Water testing pipelines and manholes; Long term testing; Creep testing; Appraisal of existing materials; Structural testing; Flat Jack testing; Schmidt hammer/pull out tests; Codes and Standards; Future developments; Appendix: Specifications and location of test equipment; Index. Consulting engineers and designers, civil and structural engineers, manufacturers, contractors and testing houses on the international scene. It will also form a useful reference for architects, chartered surveyors and students in all these disciplines.